Wapsie Valley Corn is an open-pollinated heirloom dent corn dating back to the 1850s. It produces ears of either all coppery red or all dark yellow kernels. Polenta and cornmeal are both milled from Wapsie Valley corn, which has both a visual and flavor punch. During the past five years, cornbread made with Weatherbury’s cornmeal and unbleached pastry flour has won three first place ribbons and one second place at the county fair. 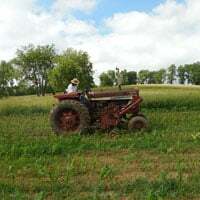 In 2018, Wapsie Valley Corn was grown in Independence Township on 3.5 acres on the farm historically known as “Pleasant View Farm.” This farm was established in 1824 by J.M Welsh. Welsh is listed in the Caldwell Atlas as a farmer, grain, stock and wool grower. Most recently, since 2006, organic grains and hay were grown on this farm. Weatherbury Farm has farmed this land since 2017. The farm has been certified organic since 2006. The corn was planted on May 29, 2018. The corn was cultivated on June 19,2018. In a “normal” year, we rotary hoe the corn twice and cultivate it twice. However, 2018 was so wet that we only had the opportunity to cultivate the corn one time. 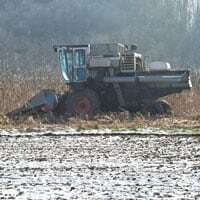 The corn was harvested on December 11, 2018. The corn, when Mother Nature and the combine cooperate, is normally harvested at the end of October. Deer, turkeys and doves love Weatherbury’s Wapsie Valley corn — so they had nearly a month and a half more time to snack this year. At the 2018 Washington County Fair, the Corn stalks won 4th place, the corn ears won 1st place and the jar of corn won 1st place. However in both 2016 and 2017, Weatherbury’s corn stalks placed 1st — beating all the GMO corn in the county! 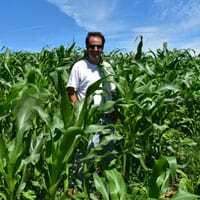 More information on corn and other grains grown at Weatherbury Farm are on the grains we grow page. To read more about polenta and cornmeal, please visit our products page. Polenta and cornmeal can be ordered on our order page. Remember the old expression: Knee High by the 4th of July! Weatherbury corn is outdoing itself! Perhaps “Dashing through the Snow” is more appropriate!